Allergies, Your Eyes, and What’s A Histamine? 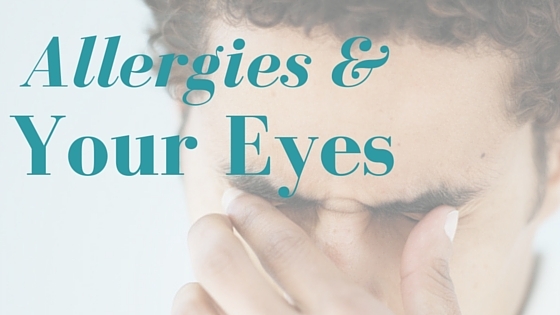 Whether or not it’s seasonal, environmentally based (all-year around harmful weather or elements), or only in your eyes, allergies come in many shapes and forms. Allergies, are scientifically defined as the release of histamines into your body to combat what it perceives to be harmful to it – such as pollen, dust mites, or other irritants. The reality however, is that these objects or naturally-occurring environmental elements aren’t really harmful to you and your body. This is why, drugs ranging from OTC such as Benadryl to prescription-only Claritin work. These drugs are histamine-blockers, or antihistamines and in turn are ‘turning down’ your bodies reaction or likeliness to react to such environmental elements. Those that suffer from allergies can experience anything ranging from swelling of the throat, to itchy, sore, and inflamed eyes or even the skin surrounding the eyes. Eye allergies are some of the most painful allergies, as the eyes are an especially sensitive body part. Those that suffer from eye allergies may benefit most from wearing sunglasses or protection during high-pollen seasons or during times and environments in which have otherwise been discovered to trigger ones allergic reaction. For those that are specifically effected from pet danger and hairs, the scientific term is called perennial conjunctivitis. Although eye allergies are not always an accompanying effect to this kind, they are not uncommon either. Those that have allergic reactions from trees, leaves, or pollen are known as someone to be subjected to seasonal or allergic conjunctivitis. Often, OTC medicines don’t work, eye-drops are only temporary, and the majority of OTC medicines actually have dangerous and concerning long-term effects. Therefore, if you or a loved one believe you’re effected from allergies, or eye-allergies in particular, it’s best to consult with a physician or specialist as necessary to get it under control – and to get a hold of a prescription-strength medication. Some people are also unfortunately susceptible to what’s known as giant papillary conjunctivitis, which is essentially inflammation, irritation, and an allergic reaction of the eyes to contact-lenses. While in most cases such an eye-allergy can be treated with OTC or prescription-strength medications and eye-drops, this isn’t always the case. In fact, sometimes it’s necessary to actually change the type of contact lenses you wear to a non-allergenic material, or switch brands completely. Some people that are effected by eye allergies don’t even know it, as they’re not familiar with the symptomology or common side effects. Eye pain, soreness, and even sensitivity to light can be recognized as symptoms of eye allergies. If left untreated, often eye allergies can escalate and make it difficult to see – or even partially (temporarily) blind someone in one or both eyes. While the aforementioned types of allergies are typically not fatal, some can be – especially if left untreated. Allergies to bee-stings, peanut-butter, and other foods can very well prove to be so catastrophic that airways are cut off, oxygen is reduced, or even halted completely and individuals can go into seizures, shock, or death. If you suspect you might have allergies, or eye allergies in particular, it’s worth getting with a professional and perhaps having an official allergy-panel test conducted so that you can become more educated and aware of allergic triggers or dangers. Author Bio: Author provides consulting services to VSI and he is an author of many articles on all types of optical and ophthalmic equipment. Author blogs about medicine, health, alternative healing, sport and healthy living.